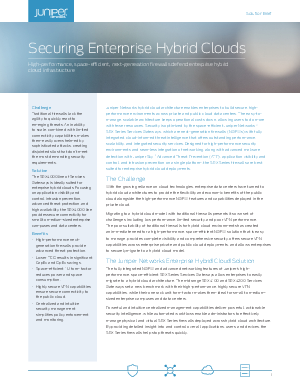 Juniper Networks hybrid cloud architecture enables enterprises to build secure, highperformance environments across private and public cloud data centers. The easy-tomanage, scalable architecture keeps operational costs down, allowing users to do more with fewer resources. Security is optimized by the space-efficient Juniper Networks® SRX Series Services Gateways, which are next-generation firewalls (NGFWs) with fully integrated, cloud-informed threat intelligence that offers outstanding performance, scalability, and integrated security services. Designed for high-performance security environments and seamless integration of networking, along with advanced malware detection with Juniper Sky™ Advanced Threat Prevention (ATP), application visibility and control, and intrusion prevention on a single platform, the SRX Series firewalls are best suited for enterprise hybrid cloud deployments.